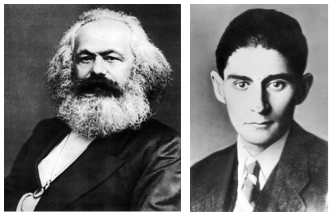 Karl Marx will remain in the curriculum, while Franz Kafka will be cut. Photos retrieved from Wikimedia Commons and counter-currents.com. Last Friday, the BHSEC administration announced that the College Seminar curriculum is undergoing massive changes which will be enacted in the Fall of 2015. In order to properly expose the student body to the “great books” of the Western canon, all texts must now meet a series of qualifications in order to be approved for use in the classroom. The first requirement is that all authors must be male. As many Seminar teachers argued, men are the only important, intelligent figures in history (not to mention the fact that they make up the majority of BHSEC’s student body). Sorry Woolf and Austen – your novels will no longer be included in BHSEC’s two-year seminar sequence. The revamped curriculum will also cut the works of Machiavelli and Kafka from the series, for their clean-shaven baby faces are simply not appropriate for college-level analysis and discussion. Genesis will also be discarded, since there is no academic consensus about its author, much less the condition of the author’s facial hair. That’s right: the Seminar teachers have decided that facial hair is the most important consideration in the creation of the curriculum. Extravagant beards are ideal, but the teachers did vote unanimously to make an exception for the elegant E. M. Forster, whose luscious mustache makes up for his bare chin. In class on Friday, Seminar teachers assured their students that whatever is lost in literary diversity will be made up for tenfold in facial hair variety. For example, although there are obviously no photographs of Plato and Homer, all of the stone busts of their heads show that the curls of their beards are simply outstanding in length, thickness, and neatness, thus indicating the significance of their literary contributions. Marx’s beard, on the other hand, may not be very well kempt, but its sheer width (not to mention its incredible frizz) clearly indicates that The Communist Manifesto is an important work. Darwin’s thick white eyebrows, mustache, and beard more than make up for the hair that he lacks on the top of his head. It would be hard to question the food-trapping potential of that wild white bush. Similarly, students will find it challenging to be discontented with the very civilized beard of Sigmund Freud. Shakespeare’s facial hair is a bit of a standout in this collection because of its color – rather than white, his mustache and beard were dark brown. Nevertheless, the perfect curves of his mustache make it difficult for even the most dignified scholar to resist the urge to stroke it. Thus, Hamlet remained in the Seminar sequence. To make up for the texts that are being cut from the curriculum, the Seminar teachers will be adding some additional authors with impressive facial hair, including, but not limited to: the lavish Leo Tolstoy, hairy Henry David Thoreau, glamorous Gustave Flaubert, and shaggy Shel Silverstein. Please contact the Seminar Department with any further suggestions.